This position manages the ship's Human Resources Division. The emphasis is on core functions such as: organizational development and effectiveness, employee relations, training and development, performance management, non-financial aspects of the crew office and ongoing HR management / administration. Manage and direct the Human Resources Division, including direct reports – Training and Development Manager, Crew Administrator and Crew Relations Specialist. Manages the budget for the HR Division. Under the supervision and direction of the Human Resources Manager, the Training and Development Manager is responsible for serving as an internal business consultant with shipboard management by leading, managing, and supporting the non-technical shipboard training and development functions onboard the ship; conducting training needs analysis; providing personal development planning and coaching; providing ongoing support and administration for the shipboard training function; and delivering instructor-led training. The Training and Development Manager should be familiar with the Human Resource Manager's duties and responsibilities and be prepared to participate in the management and supervision of the Human Resources division as needed. Oversees the crew sign-on and sign-off process, as directed by the Human Resources Manager, reviewing immigration documentation such as passports, visas, Alien Resident Cards (ARC), Letters of Re-Employment, etc. to determine validity of documents. Refers unusual documentation to the HR Manager. Ensures the efficient clearance of Crewmembers signing on and off through Customs and Immigration by diplomatically encouraging a productive relationship with the relevant officials. Supervises the Crew Relations Specialist in the sign-on and sign-off processes, and ensures Crewmembers receive all documentation prior to sign off, including airline tickets, medicals and training records. Supervises the 90-Day US CBP Inspection of all Crew, with the assistance of the HR Manager, T&D Manager, Crew Relations Specialist, Crew Payroll Manager and 2nd Purser Payroll. Works on a rotational basis with the Crew Relations Specialist in the Crew Office performing a variety of related duties. Works with Financial Controller staff in the Crew office in a cooperative, productive and effective manner. Including but not limited to assistance with Payroll Stuffing. As part of the HR Division fully supports Crew Activities and events that help increase Crew morale and optimize positive Crew comments of the overall Crew Relations operation. This position will "Deliver the Wow" through industry leading service, while continuously striving to exceed hospitality industry standards. Potential candidates must have at least one year front of house supervisory experience in a hotel, resort or cruise line. Through excellence in leadership, also consistently supporting Royal Caribbean International"s Gold Anchor standards. Delivers a variety of non-food and beverage items to staterooms such as amenities, flowers, mail, etc. 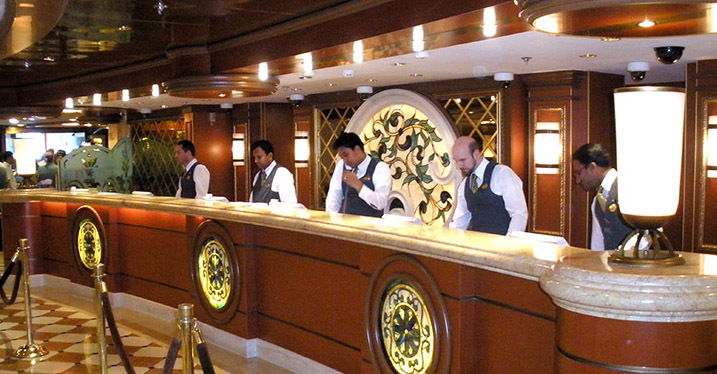 Provides boarding and departure assistance to guests with special needs, stateroom cleaning services to guests while Stateroom Attendants are off duty, courteous and professional response on the telephone to guest's requests and other shipboard personne and delivers guest laundry and dry cleaning. Provides language assistance and translation to non-English speaking guests. Assists guests with translating spoken passages, documents, and other material from one language to another. Provides consecutive or simultaneous translation between languages. As schedule permits visits international guests during dinner to provide assistance. Must be fluent in the following core languages: English, Italian, French, German, Spanish and working knowledge of Portuguese. As our Associate International Ambassador, you will manage the international program onboard our ships. You will interact with our multilingual guests to provide language assistance and verbal translation to ensure they enjoy all aspects of the cruise experience. Coordinates activities and arrangements for group meetings, conferences and functions. Meets with group representatives. Responsible for the scheduling of the Conference Center, Executive Boardroom, Multi-media room and the Business Services areas. Consults with representatives of client group or organization to plan details such as number of persons expected, display space desired, food service schedules, etc. Resolves conflicts quickly and efficiently and provides alternative arrangements as needed. Cross sells or up sells products and services to compliment the cruise experience. This is a key member of the shipboard management team. The Guest Services Manager possesses a dynamic outgoing demeanor with a passion for ‘Delivering the Wow’ through industry leading service while demonstrating exemplary problem resolution skills. The Guest Services Manager continually strives to exceed hospitality industry standards while ensuring complete guest and team satisfaction. This role establishes and drives a positive working environment and focuses on operational goals where training, leadership, development, and recognizing overall team performance are paramount. Leading by example and from the front of the house, the Guest Services Manager is the ship's driving advocate for delivering outstanding customer service to our guests that goes above and beyond their expectations each and every time. Manages a team that excels in delivering industry leading service to our individual, international and group guests. Responsible for motivating, coaching, training, evaluating and tracking development on an individual and team level. The Cruise staff hosts and participates in shipboard recreational, entertainment and social programs geared towards adults and families. In addition to other requirements, potential candidates should have minimum two years master of ceremonies or professional entertainment (theatre, music, dance, comedy, etc.) experience with resorts, cruise lines, entertainment or recreational industries. Socializes with guests in public areas at all times in accordance with Royal Caribbean International"s Gold Anchor Standards. Visits guest lounges at specified times to converse with as many guests as possible in the time allotted. Attends Captain"s Cocktail Party and Welcome Back Party to provide introductions, collect invitations, socialize and coordinate the flow of the reception line. Participates in shows and events presented by the Cruise Director"s Division by taking part in skits, and/ or simple dance routines. Instructs, organizes or facilitates various activities and/or tournaments. Concierge is responsible for providing a variety of personalized services and information to entitled guests inquiring at the Concierge Lounge. The Concierge actively listens and extends assistance in order to resolve all guest issues and concerns. A strong guest satisfaction disposition is mandatory, a people person with a great sense of humor. Concierge must possess outstanding hospitality, focused customer service, strong communication and organizational skills and effective decision-making abilities. The Guest Services Officer will be responsible for ‘Delivering the Wow' while demonstrating exemplary problem resolution skills to our guests at all times. Actively listens and extends assistance in order to resolve all guest issues and concerns. A strong guest satisfaction disposition is mandatory, a people person, with a great sense of humor. The Guest Services Officer must possess outstanding hospitality, focused customer service, strong communication and organizational skills and effective decision-making abilities. Maintaining a high level of professional appearance and demeanor at all times. Enhances department and company reputation by accepting ownership for accomplishing new and different requests, exploring opportunities to add value to job accomplishments. Must posses a positive and clear speaking voice, taking the time to understand all requests in detail. Responds to escalated guest concerns in a considerate, professional and positive manner by showing empathy and listening actively. Leads and participates in a variety of Sports Deck and Cruise Director activities and duties such as climbing wall, Flowrider, in-line skating, golf simulator, volleyball, basketball, golf course, ping pong, shuffle board, theme nights, spot lights, gangway etc. Promotes and serves as Master of Ceremonies in Sports Deck activities, and ShipShape programs. Issues equipment to guests for: climbing wall, in-line skating, golf simulator, Flowrider, volleyball, basketball, golf course, ping pong, shuffle board, etc. Explains and demonstrates use of apparatus and equipment for: climbing wall, in-line skating, golf simulator, Flowrider and any other related activities. Leads ShipShape classes and events. Organizes and conducts tournaments. May serve or participate as master of ceremonies. Explains and demonstrates principles, techniques, and methods of regulating movement of body, hands, or feet to achieve proficiency in activity. Observes guests during activities to detect and correct mistakes. Manages the diving program onboard and at the private destinations. Provides guided tours, instruction and promotes equipment rentals on the islands. Observes and evaluates employees and work procedures, assigns duties and responsibilities and initiates personnel actions such as new hire requests and discharges. Manages the financial aspect of the diving operation including identification of expense reduction through cost efficiencies and revenue growth through promotional and up-selling activities. Provides on the job training to staff members. As Purser Printer you will be preparing the typesetting and printing of all onboard materials. Working closely with different department heads and staff. Performs garment alterations for guests and crewmembers. Studies garment and uses tape measure to measure sections such as sleeves, pants and hems Marks alteration lines and re-sews garment using needle and thread or sewing machine.